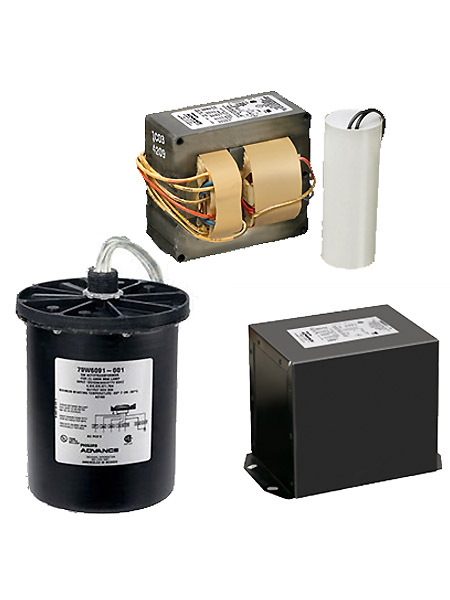 High Intensity Discharge ballasts operate a vast array of High Pressure Sodium, Quartz Metal Halide, and Ceramic Metal Halide HID lamps in the market today. HID lamps are similar to fluorescent lamps in that they are gas discharge lamps. The arc tube, made from Quartz glass or ceramic materials is located within the ‘jacket’ of the lamp and contains electrodes at either end of the tube. The arc tube generates light when the electrodes at either end of the tube initiate an electrical arc. This excites the pressurized sodium or metal halide gasses causing them to emit light. 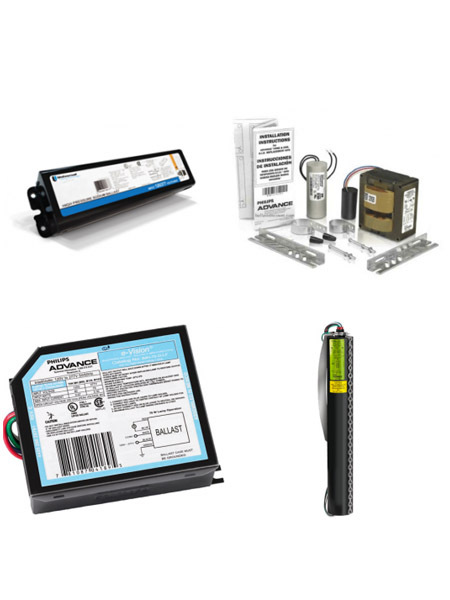 Like fluorescent lamps, HID lamps require a ballast to operate. The primary role of the ballast is to supply the correct starting and operating voltage to initiate the arc, and to regulate current and voltage to sustain the arc once illuminated. 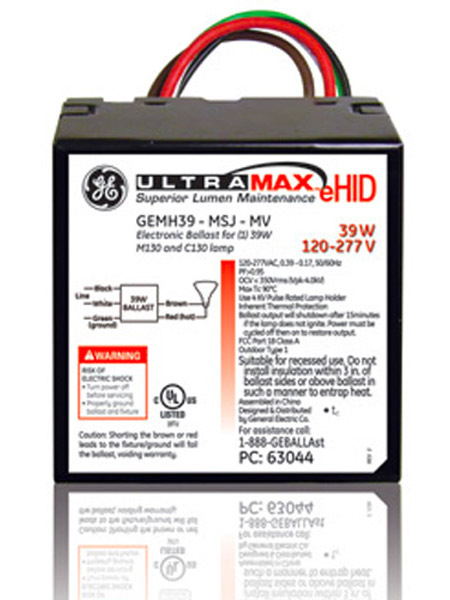 HID lighting in the United States takes power at one of five voltages; 120,208, 240, 277, or 480V. While 120/277V are the most common in the United States because of the ready availability of power sources at these voltages, 208 and 240V are often utilized because of the heavier loads and longer runs associated with HID lighting (large malls, factories, parking lots). 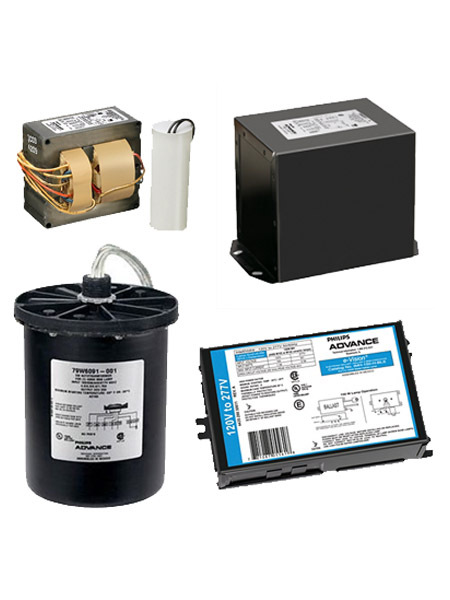 In order to accommodate all of these different voltage inputs, GE lighting offers ballasts with multiple input voltage taps. 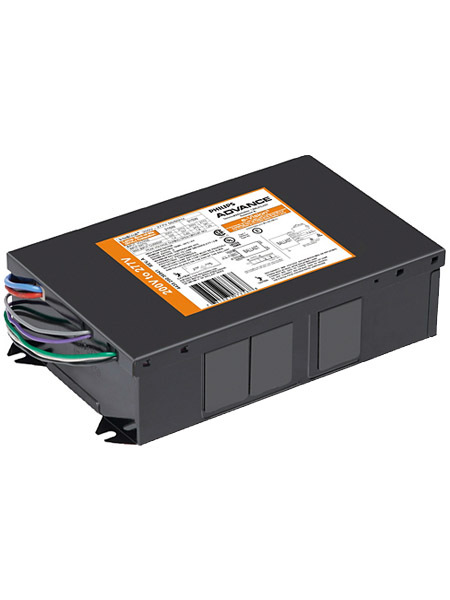 Not all ballasts wattages are available in all configurations. 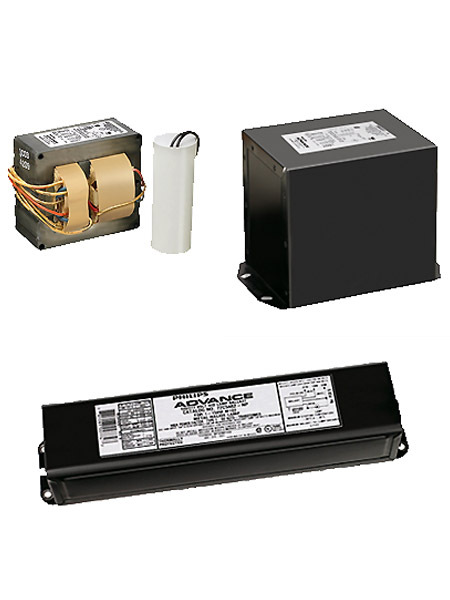 HID magnetic ballasts consist of robust core and coil designs that meet or exceed minimum ANSI requirements. 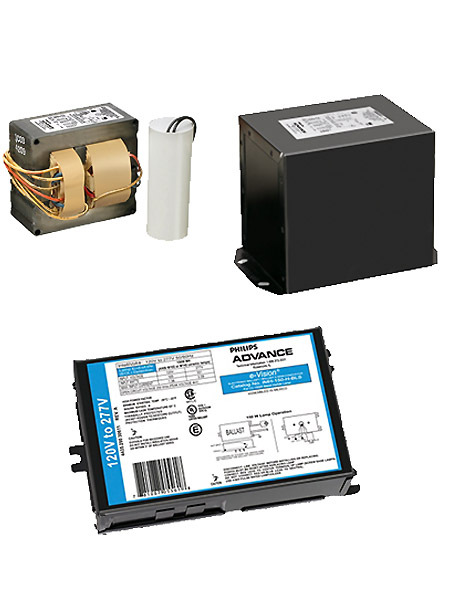 These ballasts are typically sold as distributor replacement kits which are pre-wired with a capacitor, ignitor (if applicable) and all necessary mounting hardware and instructions. Each wattage is typically offered in quad (MLT-120/208/240/277 volt), 5-tap (ML5-120/208/240/277/480 volt) or 480 volt (48T) options. Gas discharge lamps have a negative resistance characteristic, which causes them to draw increasing amounts of current and can result in immediate lamp failure if operated directly from the main power line. It is the purpose of the ballast to prevent this by limiting current provided to the lamp for smooth and consistent operation. The ratio of light output produced by a lamp operating on a ballast vs. the lamp’s rated life output is referred to as the ‘Ballast Factor’. 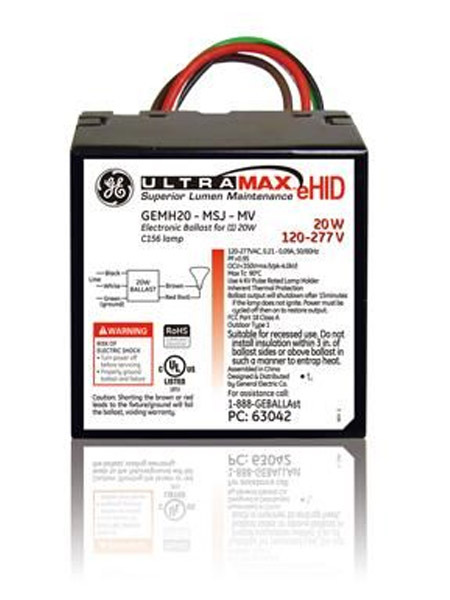 All GE HID ballasts have a ballast factor of 1.0, providing full luminance. When ignited HID lamps take time to warm-up and reach full luminance. Any interruption of input power or a sudden voltage drop may cause the arc to extinguish. Hot HID lamps will not restrike immediately. Prior to restrike, the arc tube must cool enough to reduce the vapor pressure within the tube to a point where the arc will be able to reestablish itself. The typical warm up and restrike times of HID lamps are below. 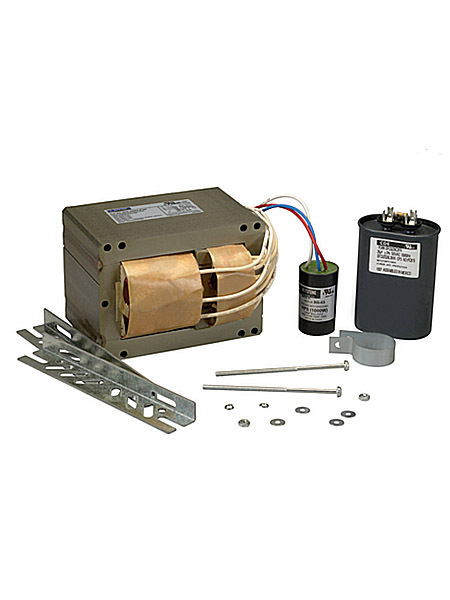 Electromagnetic HID Ballast The typical electromagnetic ballast is the exposed core & coil ballast, which is commonly used as a component in HID luminaires. This type of ballast is called a core and coil because it consists of one or two copper coils on a ‘core’ of high-grade electrical steel laminations which are welded together. The ballast is then vacuum impregnated with a specialized varnish chosen for its electrical, thermal, and sound attenuating properties. 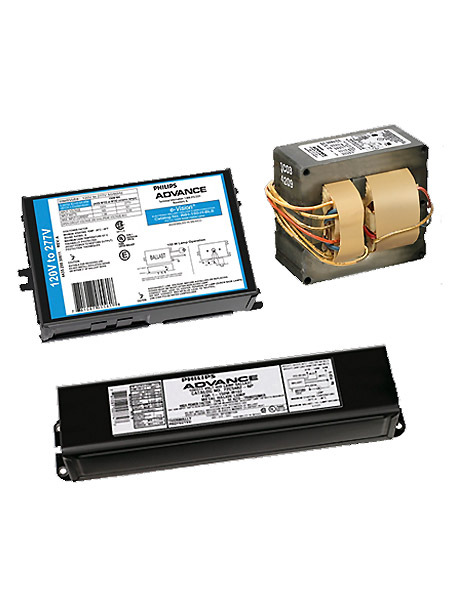 All GE Core & Coil ballasts have a UL Class H thermal rating (180°C).